Blurb: Two minds united against a common foe. Two hearts afraid to show their love: Long ago Tamarith fell in love with a man she can never have, and is convinced she will never love another. However, she cannot help but be intrigued by a handsome stranger whose psychic powers exceed even her own. Vidarh seeks only to find his true purpose in life and to win the regard of his father, who eschews his sons psychic abilities. Thrown together by a common threat to their planet, then torn apart by an evil greater than any they could have imagined, can Vidarh save the lovely Nifl woman who has captivated him, before it is too late? Will Tamarith and Vidarh overcome the deadly enemy who threatens to destroy all they know and love? Will they find the happiness they both seek? Or are they fated to live their lives alone? 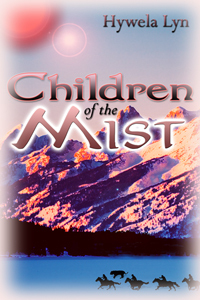 ('Children Of The Mist' includes characters from 'Starquest' as well as introducing some new ones, although it is a complete 'stand alone' novel. it follows on from the original 'Starquest'.